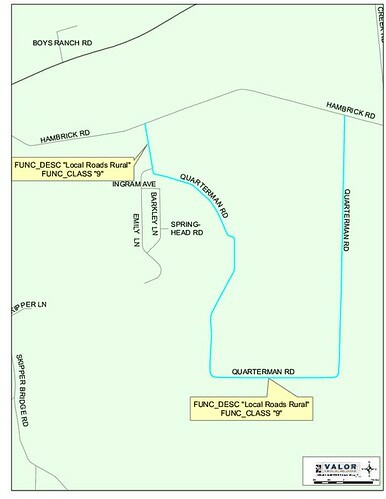 which shows the RDC classification of Quarterman road into two parts, divided at the subdivision entrance, each part functional classification 9, rural local road. Not only is it possible, it has happened in Georgia, and as we see by the SGRDC map, Quarterman Road itself is an example, since it is already classified in parts like that for 911 service. Why would residents of the subdivision drive 3 extra miles the long way around Quarterman Road just to get to the same Hambrick Road they can reach much faster by going the shorter way? I can attest that they don't. Even if there is sufficient traffic from the subdivision to reclassify the short part of Quarterman Road as a collector (and I have not even seen any evidence of that), traffic from the subdivision is no reason to reclassify the long part of Quarterman Road. Driving around Quarterman Road every day as I do, varying when to cover all times of the day, I have seen even less evidence of sufficient traffic to justify any change in the classification of most of Quarterman Road. Some of the sheets of the road plan given to bidders for grubbing and clearing are still dated 2001. And the right of way that that plan was designed to fit was obtained in the early 1990s, as Commissioner Lee reminded us all at a public commission meeting; I think he said 1991. The current design for paving the road thus long predates the county's Comprehensive Plan. If the current road paving plan was designed with the intent of turning Quarterman Road into a collector, that design needs to be revisited in the light of the Comprehensive Plan. 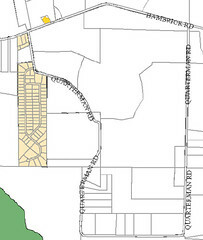 The third map is detail from the Lowndes County zoning map of 11 December 2007, corresponding to the current Unified Land Development Code (ULDC). With the exception of the yellow of the grandfathered-in subdivision and one grandfathered-in house plot, and the green of the river conservation zone, it shows the entire area in white, as zoned E-A, or estate agricultural. 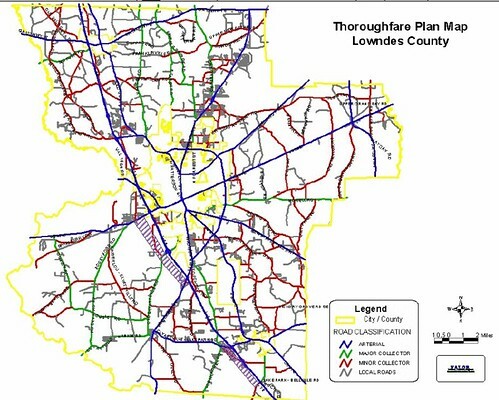 The fourth map shows the 2030 Lowndes County Future Development Map from the 2008 ULDC (same vintage as for the zoning map). 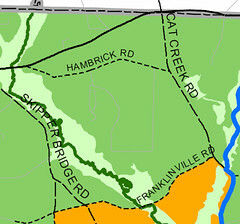 Green on this map means "Agricultural / Forestry", and the entire area between the Withlacoochee River and Cat Creek, north of Franklinville Road to the county line, is green, including Quarterman Road. This is the map form of the long-term Comprehensive Plan the ULDC is supposed to implement. It is clear that the county has no plan to develop this area that would justify reclassifying Quarterman Road as a collector. The road design also long predates the subdivision, land for which was only sold in 2003. However, the road design is not a legal decision like the 1980s vintage rezoning that permited the subdivision to be built. The road design is merely an engineering specification that can be changed. The county already has changed it for the tree canopies, for which I thank all involved. The county could for example make the road design narrower or put in speed bumps, thus keeping the design speed low. Changing Quarterman Road's status to collector would be a substantial change to the Comprehensive Plan, and should only be done by an explicit vote of the commission, which has not taken place. Meanwhile, only last year the commission denied a rezoning request for another subdivision on Quarterman Road, thus re-emphasizing the agricultural and woodland nature of the Quarterman Road neighborhood. Reclassifying Quarterman Road from "Local Roads Rural" to collector would not make it safer. Quite the contrary, it would indicate a higher speed limit, which would make this local road through a rural neighborhood with small children, teenagers visiting each other, cats, horses, dogs, bicycles, and farm equipment, less safe. As we have seen in previous posts, three ways to make the road design better fit a rural local road through an agricultural and woodland neighborhood would be to make it narrower, to not make the curves as smooth or to add speed bumps, and to set the speed limit slower.